ATTORNEY: Now doctor, isn't it true that when a person dies in his sleep, he doesn't know about it until the next morning?" The Gazette takes a holiday. The next edition will be out on or about 15 January 2011. Everyone have a Merry Christmas and a Happy New Year! We spent most of October preparing for the Yellow Halloween Ball, and this edition's lead story is about that event. Build of the Month features shots of builds recommended by the contest winners. In Building Tips, we are reviewing all the information in the Object Box, and how you can use it to your advantage. We continue with the further adventures of Fuzzy who is trying to find his vest and his mate Shakey. And a finally, a big thank you to Highwayman48 who did a very nice YouTube video of the Halloween site, which may be found at http://www.youtube.com/watch?v=_Q3GSJrYkWc . 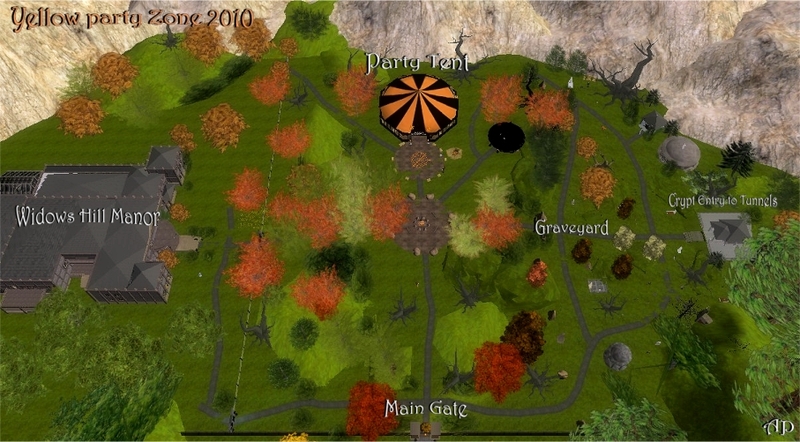 Nearly 90 people attended The Yellow Halloween Ball which was held in the Old Echo Meadow, between the cemetary and the haunted house, just outside of Admiratio Village in Yellow. It was very wild affair, with people dressing up, or morphing into their favourite critters for the event. PKToons supplied the music, with Class3 and Veger doing stints as DJs throughout the night. Along with the dancing, people could wander into the graveyard, the crypts, into the haunted house, or take a risk in getting to the end of the Hare Dare Maze. All this was observed by a variety of not so celestial entities, such as a variety of ghosts, zombies, demons, and other creatures. To make the night even more interesting, the Yellow Gazette staff organised two contests, with prizes of citizenship extensions for the winners. There was a game of Hide and Seek; "Find this guy" said the sign. People had to explore the whole site to try to find Rufus Fuzzybottom, who was wearing a Ghostbusters costume (most appropriate for the event). Rufus was located in the upper level of the east tower of the Widows Hill Manor. A large number of people had really put a lot of effort into their costumes, and according to the judges, an extremely difficult contest to judge. The winner of the Find Rufus contest was Buddy, who was awarded two months extension on his citizenship. The best costume contest was announced just past midnight VRT, after considerable nail biting and angst by the Yellow Gazette staff, who were the judges. The winners of the contests were: NicoPaul, who won a three months extension; Shirin got two months, and Dreamer2 gained one extra month on her citizenship. Events such as this don't happen without a lot of cooperation by a variety of people. The Yellow Gazette staff worked very hard to bring the event to life. Special thanks are also due to Flagg, who was instrumental in getting the dance kiosks and the Ground Zero teleport system set up; PKToons and Class3 did a magnificent job with the music. Bach Zhaa, SWChris, Veger and others were terrific in getting the word out to various worlds through their advertising and announcements, and Maki's sterling efforts in the AWNewsletter made sure that every citizen was aware of the event. And of course, thanks to all who turned up to make the event such a success. In which our hero keeps his job and goes to a party.